It’s Carnival Time! – Putignano Spettacolo! This year I have to do it! The Putignano Carnival that is! Previous years, the weather hasn’t been so kind, so this event has eluded me. 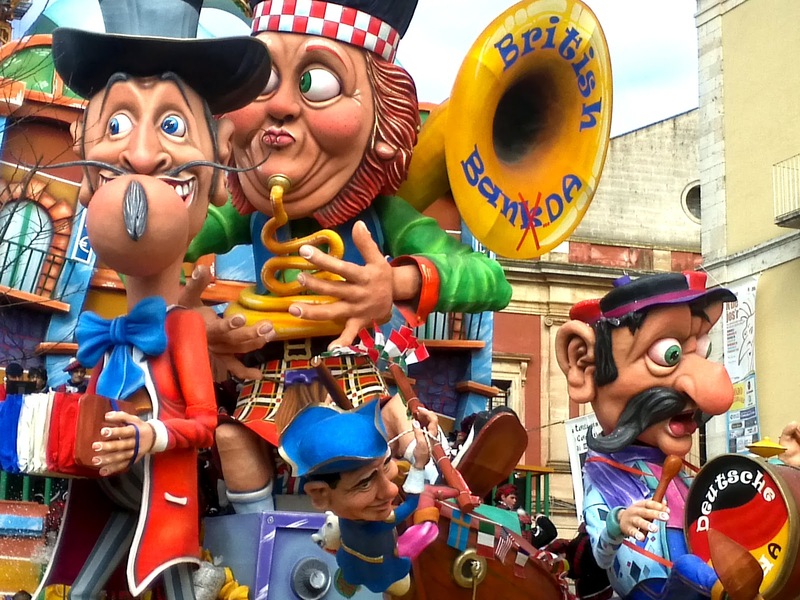 The Putignano Carnival is a major event in Puglia, in fact, it is one of the biggest carnivals in Italy and one of the oldest too, dating back to 1394. It all began when the Knights of St. John decided to transfer the relics of St. Stephen from the Castle of Monopoli, to a safer haven, inland, to Putignano. The peasant workers saw the carriage being carried by the Knights, and once they learnt that it contained the sacred relics of St. Stephen, and that he was to be laid to rest in the city of Putignano, the workers were overwhelmed and honoured by such a prestige. As a sign of respect to St. Stephen, they began to follow behind the carriage. Word soon spread and large numbers of people followed the procession all the way to the city centre. His final resting place is still unknown. Ever since that day, the city has honoured St. Stephen with a grand event spanning over several weeks. It all begins on the 26th December, St. Stephen’s day, with prayers at Mass, poetry readings and candle lighting. 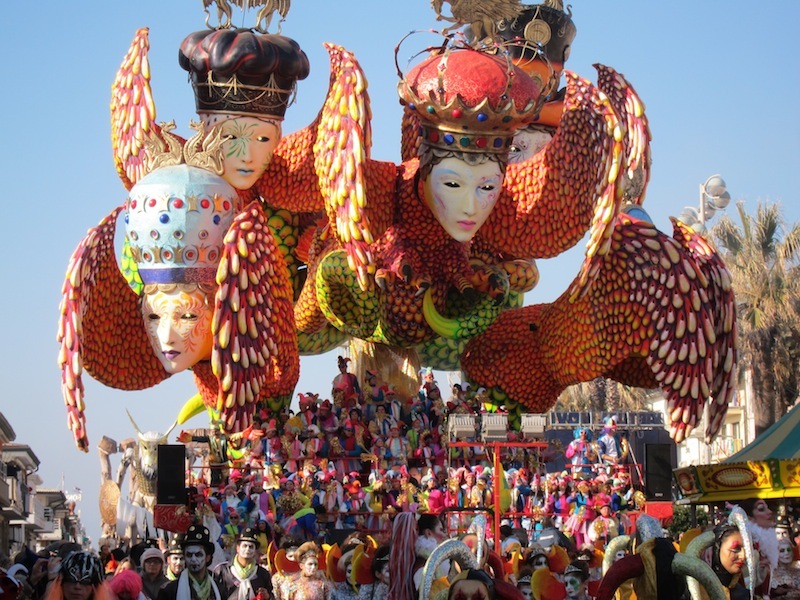 The grand Putignano Carnival, with elaborate paper-màche floats, party revellers dancing in the street, wearing colourful masks and costumes takes place on Shrove Tuesday. However, there are lots of festivities taking place before then. After Christmas the countdown to lent begins, and celebrations are held every Thursday with concerts and masked dances. But that’s not all, three weeks before Shrove Tuesday, each Sunday is filled with colour, music and festivities as the grand carnival processions passes through the city. The enormous paper-màche floats, some towering up to 50 feet high, range from amazing to grotesque, often depicting topical scenes, making fun at politicians, priests, and capturing the latest hot gossip. Just when you think you’ve seen it all, Putignano pulls out all the stops for the grand finale on Shrove Tuesday. It’s bigger, louder and brighter and culminates with a ‘funeral’ procession where masked priests lead a paper-màche sacrificial pig to Putignano’s main Piazza where it is ritually burned. The ‘Campana dei Maccheroni’ church bells ring out 365 times and signals the end of the celebrations. Lent is about to begin and after all the festivities, it’s a good time to abstain! ← Real Neat Blog Award!